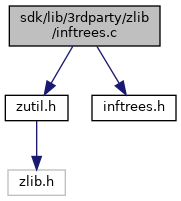 Definition at line 9 of file inftrees.c. Definition at line 32 of file inftrees.c. 89 lens are in the range 0..MAXBITS. The caller must assure this. 91 symbol does not occur in this code. 155 fill the table with replicated entries. 161 being filled, and drop is root when sub-tables are being filled. 166 entered in the tables. 177 in the rest of the decoding tables with invalid code markers. Referenced by fixedtables(), inflate(), and inflateBack().
" inflate 1.2.11 Copyright 1995-2017 Mark Adler "
Definition at line 11 of file inftrees.c.